A blogging friend, Isabelle At Home, posted a recipe for this easy-to-make candy on her blog the other day and I thought "Wow! That looks good." so I decided to try it myself. Butterscotch and peanut butter mixed with peanuts and shoestring potatoes make a sweet-and-salty treat that's hard to resist. 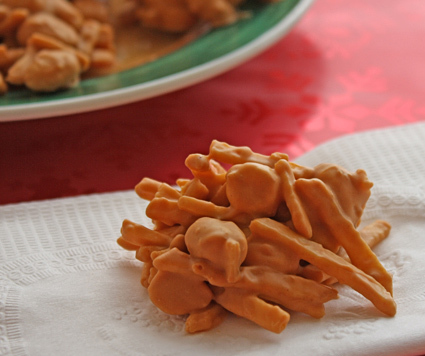 In a microwave-safe bowl, melt butterscotch chips and peanut butter; stir until smooth. Stir in peanuts and shoestring potatoes; blend until evenly coated. Drop tablespoonfuls onto waxed paper-lined cookie sheets. Place in fridge; wait 30 minutes or until candy is firm. Enjoy!